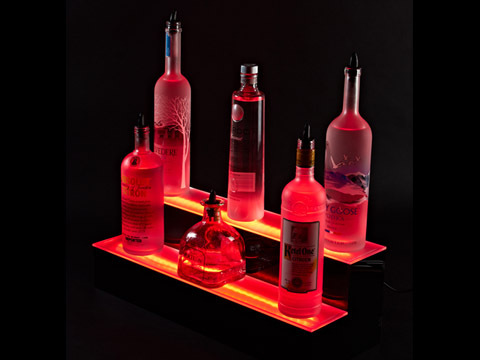 Armana Productions LED bottle shelves and LED displays are a unique, intriguing, and functional gift for the home and commercial bar owners. Plus they are perfect for use in a kitchen, man cave, liquor cabinet, or wherever you want to illuminate something with the cool effects of LEDs. Our LED Shelves are ultra thin, measuring in at only .75” thick. They are lightweight, yet durable, and designed to add any object onto the shelf you want to illuminate. Armana shelves can be added to an existing platform, or can be purchased with clear acrylic brackets, for easy wall installation. These products are a perfect addition all around the home, including existing china cabinets, liquor cabinets, kitchen banquet tables, existing kitchen display shelves, the basement home bar, the mantle above the fireplace, the trophy room, you name it, and there is probably an opportunity to add this exciting product to it. Many customers simply use the platform for ambient lighting for the holidays. Something as simple as placing the shelf behind garland on the mantle, can add a beautiful red or green glow for the holidays. These items, made entirely of Acrylic, are elegant in their look and will delight those people that are tough to buy for. Using the included wireless remote to change colors, or fade between colors automatically brings additional entertainment value to the products. You can even create your own LED colors and store them in the remote, for easy access at any time. Armana products are made right here in the US and are designed for both the home and commercial user. If you’re looking to add a new element to your restaurant, lounge, nightclub, or even dive bar, the Armana liquor shelves and bottle displays are perfect items to enhance the ambiance at your business.